The Polish Quarterly of International Affairs jest anglojęzycznym kwartalnikiem Polskiego Instytutu Spraw Międzynarodowych poruszającym kwestie Europy Środkowej i Wschodniej. Poprzez publikowane w nim artykuły dotyczące współczesnych wydarzeń, stanowi forum do analiz i debat na temat spraw międzynarodowych. Każde wydanie zawiera zbiór autorskich artykułów poddanych ocenie „peer review”, a także recenzje książek. Almost a decade has passed since the events of the Ukrainian Orange Revolution, which dramatically changed the political environment in Ukraine. Many researchers supposed it would be a turning point from an autocracy to a consolidated democracy. The revolution brought to power a new generation of politicians with an updated agenda for the country’s domestic and foreign policies. The enthusiasm with which politicians proclaimed the course for the political and economic renewal of Ukraine, as well as rapprochement with Euro-Atlantic structures, made Ukrainians believe that joining Europe was not as far away as previously thought. In addition, many European leaders welcomed Ukraine’s commitment to democratic reforms and offered their help and assistance. This gave rise to speculations about the steadily improving climate for relations between Kiev and the more developed democratic states. At that time, it seemed Ukraine was just about to open the doors to many influential international organisations. NATO’s military performance in Libya raises important questions about which allies are willing to use force in NATO operations, and more broadly, about the principle of military burden-sharing, which has received extensive treatment from scholars. Using a structured and focused case study approach, this paper examines three of Europe’s NATO allies—Norway, Spain and Poland—all of whom played widely different roles in Operation Unified Protector. 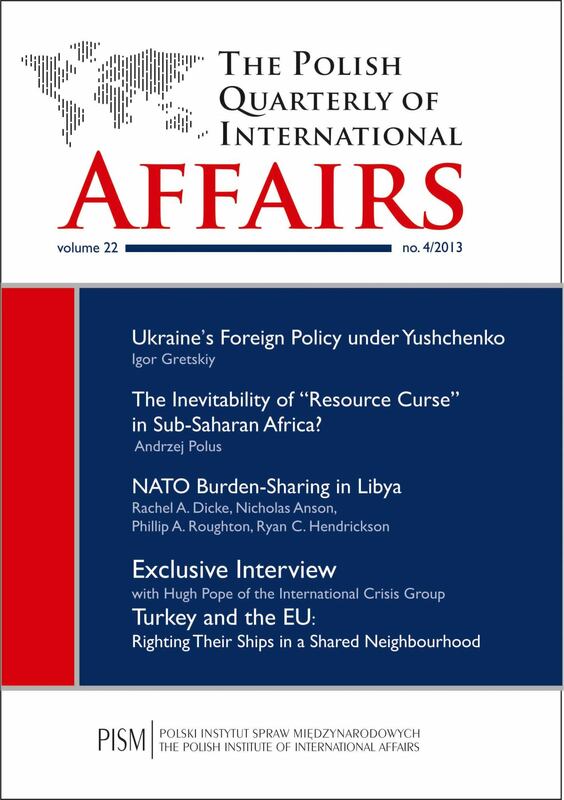 Using previous research on burden-sharing as well as literature more specific to NATO military operations, we examine three variables across these three NATO allies—public and government support for the strikes, national strategic culture, and perceived member benefits for the use of force—all in an effort to evaluate the conditions for when a European ally may be willing to act militarily. These research findings speak to NATO’s ability to meet future security challenges, the role of European militaries in American foreign policy, and, hopefully, will provide broader insights on the conditions that foster burden-sharing in alliance military operations. Contrary to widely held assumptions, and deriving insight from literature in sociology and social psychology on relational repair among individuals, the author argues that relational repair at the interstate level requires some efforts, sometimes very important ones, and that waiting until the crisis is over before starting work on relationships may not be the most efficient way for the countries concerned to facilitate relational repair. In the case studies presented in this paper, the countries that start their relational repair processes as early as possible in a crisis help prevent its escalation and pave the way for the restoration of any damage done to their ties. This paper is a result of field studies in Botswana, Zambia and Ghana, all mineral economies considered to be potential victims of the “natural resource curse” (or, NRC here). According to the core assessment of the NRC hypothesis, mineral revenues in Sub-Saharan Africa do not necessarily improve the economy; instead they may lead to increased poverty and often to the establishment/ empowerment of authoritarian and neo-patrimonial regimes. Even though a strong civil society is perceived as a potential counterbalance to government actions, in the case of Zambia, Botswana and Ghana three distinguished patterns of interaction between governments and civil society organisations (CSOs) have been created, and a vibrant and vocal civil society does not necessarily imply that NRC is avoided. The principal aim of this paper is to examine, comparatively and critically, the involvement of local and international CSOs in the governance process of resource-based economies. The paper develops a two-fold argument. First, that NRC could be more usefully perceived as a treatable “disease,” and second, that the strength of civil society and its involvement in politics does not prevent NRC. When pondering the issues that make life in Kosovo difficult, then which makes Kosovo difficult for the rest of Europe, one would hardly place terrorism at the top of the list. In Kosovo, other problems command attention: state agencies, international organisations and NGOs list international organised crime, corruption, and the economic crisis as the three most menacing spectres in Kosovo. The EU progress report for 2012 states clearly that “to date, terrorism has been a lesser threat in Kosovo than other forms of serious crime” and indeed, enough incidents of terrorism have not occurred to persuade international observers that it poses an insidious danger. One could, however, wonder whether the international community is able to read the writing on the wall when it comes to the increasing possibility of religiously motivated terrorist activity. By examining the processes of Islamic radicalisation in Kosovo, this paper argues that, although Kosovo has a secularised Muslim population, radicalisation by stealth has already started, out of view of the public, and there is an increasing possibility that a terrorism hub will develop in the region.